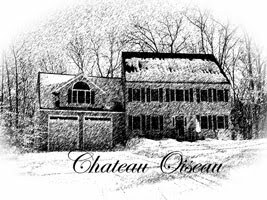 Chateau Oiseau: The Fall 2011 Winemaking begins! 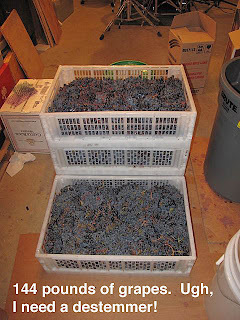 The Fall 2011 Winemaking begins! Well, the summer seemed to fly by and I haven't posted an update here since the end of June. So what has happened? Due to my travel schedule, I had to harvest the Marquette a little earlier than anticipated at around 22 brix because I had a trip to the Maldives and I was afraid they would hang too long otherwise. 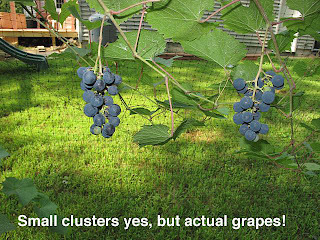 In addition to the rain during flowering which made for some bad fruit set and small, loose clusters, we also had a solid week of rain in late August that caused a lot of grapes to split. 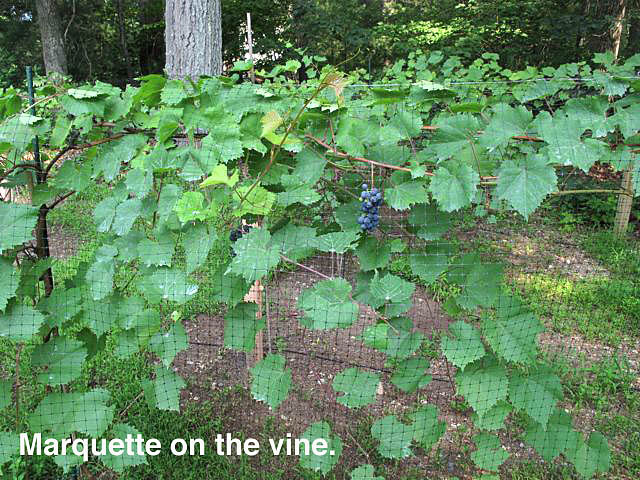 Overall, 2011 was a terrible year for growing grapes in Massachusetts. At least for me. 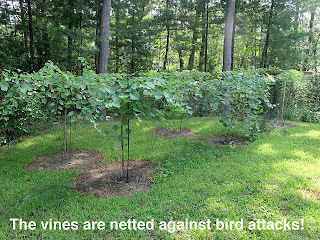 Fortunately, I only had a few vines making fruit and there was no way I was going to get enough for a batch of wine anyway. So this is just an experiment year. 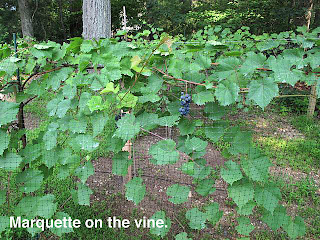 My Reliance (seedless) vines made a ton of grapes, and then right before they were ready to harvest, they all fell off the vine. Some had bee damage, but most just literally fell on the ground and got eaten. 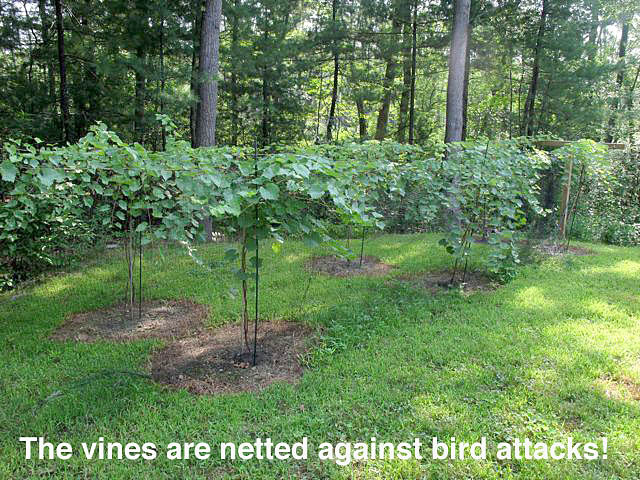 The vines were well netted. I have no idea what happened, but it has shaken my belief in Reliance. I have decided to remove the whole row of them in the spring and replace with Marquette. 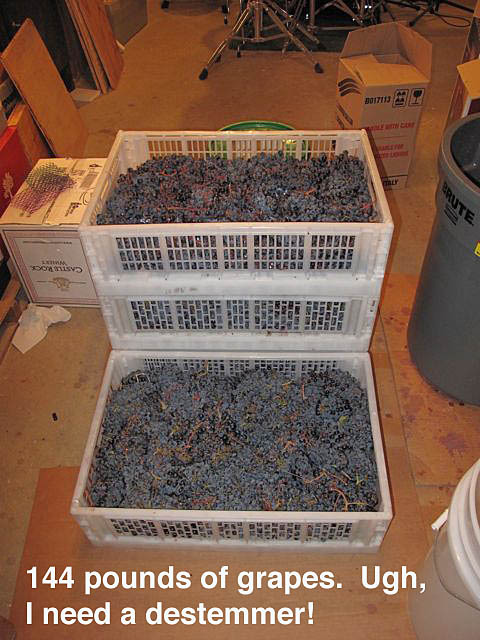 Reliance is not for making wine and I have no idea what to do with 40 pounds of Reliance if we ever get a harvest. Because I was going to be in the Maldives during the time when the California grapes would arrive for us east coast winemakers, I made the decision to order Washington state grapes for my fall winemaking. They wouldn't come until October, and I would be back from the Maldives. Since Washington Pinot Noir is not an option from my local retailer, I ordered Merlot and Cabernet Sauvignon to make a "Bordeaux blend." I find it odd that we can get Cab from Washington but not Pinot noir. 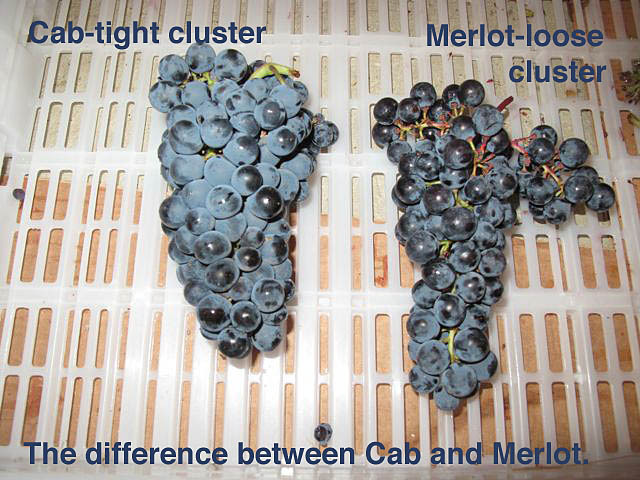 It seems to me that it must be hard to ripen Cab that far north, but that is a great climate for Pinot Noir. 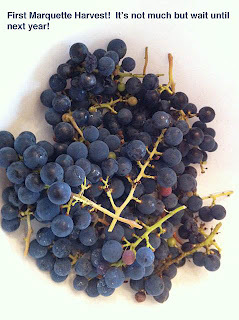 The grapes arrived yesterday so I had to drop everything and go into wine making mode (something I enjoy!) As usual, I manually de-stemmed all the grapes. My daughter helped for about 10 minutes then got bored and left. My fingers were sore (and purple) all night afterwards. I really need a destemmer. 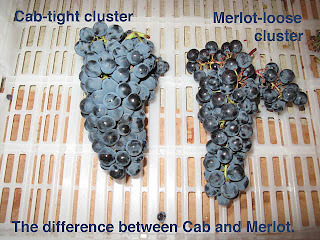 For the most part the Cab looked as Cab should--tight clusters that are hard to de-stem, with dark blue berries. But when I crushed them, the seeds were still green--a sure sign that they are not ripe. My refractometer (see pic here) indicated between 22 and 23 brix on all the berries I tested, which is to say definitely not ripe. I can only imagine the pH. Fortunately, I'm doing a co-ferment blend with the Merlot and those berries had nice brown seeds and tested out at 26-27 brix (nice and ripe) so with any luck, they will cancel each other out and end up good. I also tossed my 2 pounds of frozen Marquette in there. So my wine will be 1.3% Estate Grown! LOL! After destemming and crushing, the pH was 3.25. Egads, that's low! A small treatment with Potassium bicarbonate brought the pH up to 3.4 which is a lot better. In addition to a tiny dose of meta to kill bacteria, I added Lallzyme EX, my first attempt with an enzyme. The point is to try getting more color and tannin out of the skins. My previous attempts with really dark grapes (Merlot, Malbec) ended up looking more like pinot noir. On this batch I'm using several different techniques to get some extraction: an enzyme, a peak ferment temp into the 90s for a day and some tannin added before ferment to bind color and hopefully deal with the expected "vegetal" character of the unripe Cab. This morning after the must had sat at 60 degrees all night, I couldn't believe the extraction of color I already had just from the enzyme! This is encouraging! Next I added the tannin and some Opti-red (again, to help with color) and started my yeast hydration. 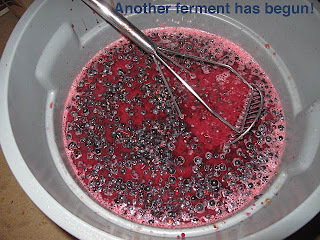 I have been using Go-Ferm for yeast hydration and Fermaid-K for nutrients along the ferment and that seems to work great. Now I have inoculated the must and I'm waiting for the ferment to start (at low temp) before bringing in the heat. This helps the yeast to get going before any bacteria can because the yeast will get going (slowly of course) at low temp much better than bacteria. Applying heat to the must before the yeast is in there is an invitation to bacterial growth. Once the must had been inoculated, it was time to bottle my Fall 2010 California Pinot noir in order to clear out a carboy. This is the third wine I have bottled. Tasting notes? Well, it's flawed but not as badly as the previous two. I consider it drinkable, which is more than I can say for the spring 2010 wines. 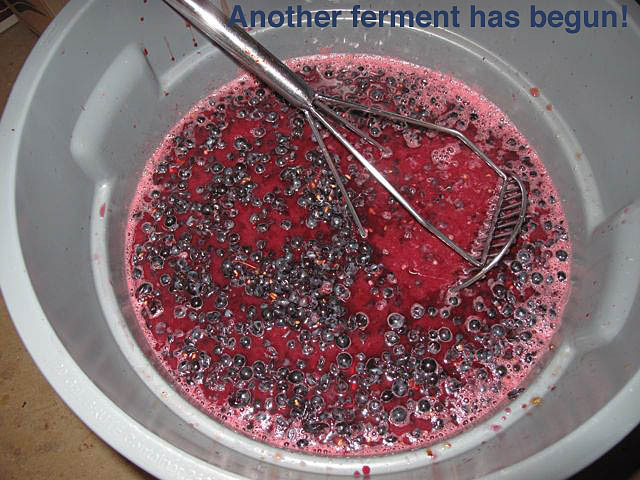 However, I still detect that "home winemaking aroma" that I detect in a lot of home-made wines, not just mine. I think it's the slight leftover taint from hydrogen sulfide. As well, the wine is pretty thin and lacks character. You can drink it, it tastes like wine, and a person who hasn't got much palate for wine (you know who you are Tim) would think it's fine. But it's flawed. I certainly won't be entering it in any wine competitions. 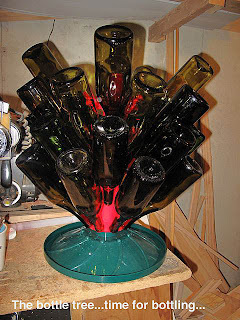 So anyway, I disinfected a bunch of bottles, put them on the bottle tree to dry, and started filling and corking. I ended up with 34 bottles. I'll label them and put on the heat-shrink capsules tomorrow. More wine in the cellar that I seriously doubt will improve with age! Next I racked the spring 2011 Merlot. 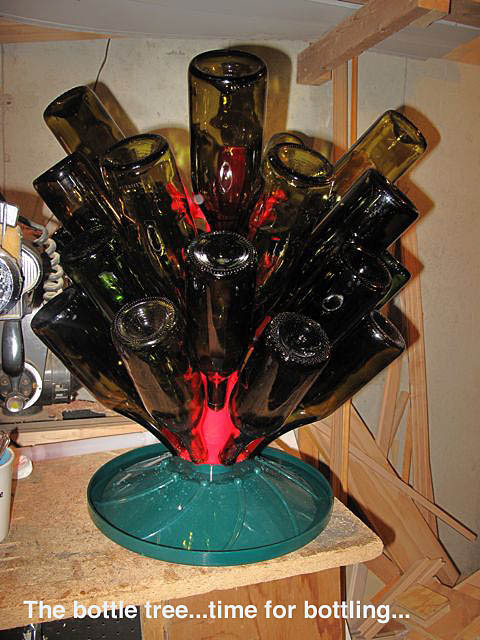 This is 6 months old and was ready for a racking plus the addition of some oak spirals. Christine and I tasted it and here's what I can say. It has no noticeable flaws! Which is a first for me. And it tastes okay. 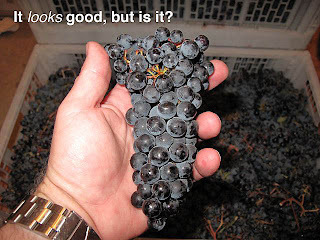 But for Merlot, it's pale and lacking tannin and body. If I handed a glass to a wine lover and asked that person to identify it, any sane person would conclude that it is pinot noir. It's not dark and "thick" like Merlot should be. For some reason, no matter what grape I start with, I keep making "pinot!" Hence you can see that I have a problem with getting good extraction. Keeping my fingers crossed on the extracting of this new Bordeaux blend! I'll keep you posted, and thanks for reading!